Our Pre-Casa program is offered at Maple Grove campus for children between 2 and 3 years’ old. The Pre-Casa Program is an environment prepared to meet the developmental needs and high energy levels of children who are transitioning from the Toddler class or entering school for the first time. The curriculum includes activities to help children develop their fine and gross motor coordination and visual discrimination through the senses as well as beginning math and language skills. 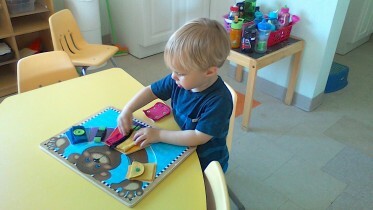 Children will develop an awareness of numbers and basic math operations. There is also a Language area with special materials to develop the preliminary skills for writing and reading. In addition, a full array of enrichment in music, art, French and Mandarin language instruction, and yoga complement the program. Toilet training is not required to enter this classroom, but children must be toilet trained prior to entering the Casa classroom. Come and experience our Pre-Casa program and discover why Montessori education is one of the best decisions you made on your child’s long journey of learning.